Do a quick Google search with the keyword ''FAMAS'' and you will end up with thousands of results talking about an assault rifle of French origin, a staple in video-game shooters and action films alike. But, when you type in the term ''awards'' after the first keyword, you'll end up with another staple in the Filipino film industry - The Filipino Academy of Movie Arts and Sciences Awards, commonly known as the FAMAS Awards. 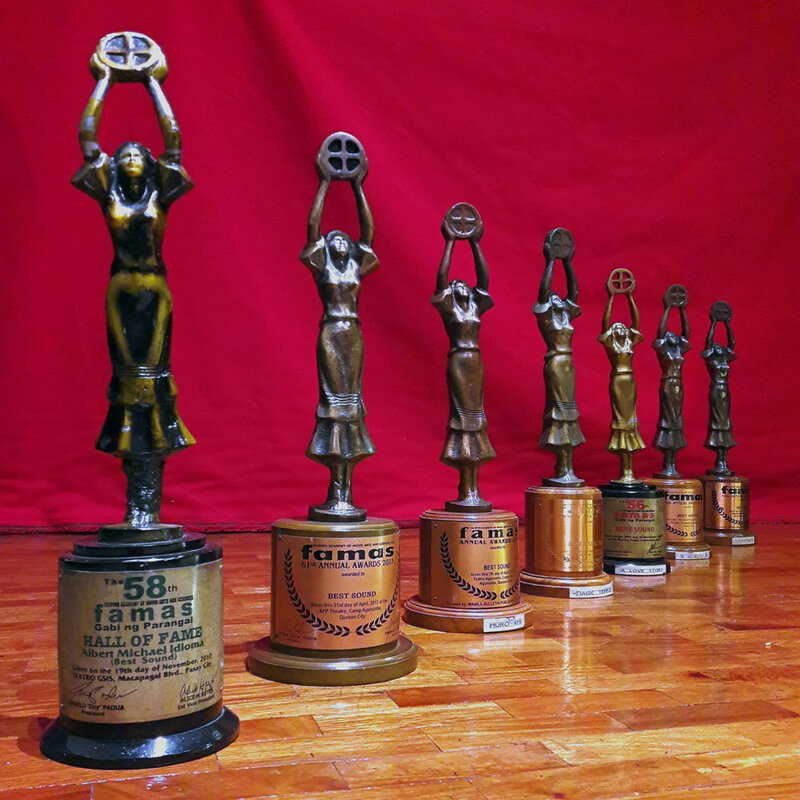 FAMAS is the oldest award-giving body in the Filipino film industry, established in 1952 with movie writers, columnists and studio publicists as its first voting members. The award statuette - modeled after the actress Rosa Rosal, features a woman with her raised hands holding a film reel standing over a cylindrical pedestal with the award name written in bold black letters. Wildsound, always valuing quality in whatever film sound design challenge it tackles, is no stranger to the honor of receiving the famous FAMAS awards. Founder and CEO - Albert Michael Idioma has over 25 nominations, with 7 ultimately won for Best Sound design in the following films. 7 WINS FOR BEST SOUND: MIKE IDIOMA WAS AWARDED THE COVETED ''HALL OF FAME'' DESIGNATION OF FAMAS AWARDS DURING THE 58TH GABI NG PARANGAL IN 2010. On a side note: In the upcoming film festivals that will be held throughout the remainder of the year - Sir Mike, as we know him, continue to lead the team in pursuing quality over any other aspect of the sound design process. And with Wildsound branching out into video-post production, this year marks the third in which the company brands itself as a one-stop post production facility where clients are friends and competitors are family. Older PostWelcome to Wildsound "Dailies"